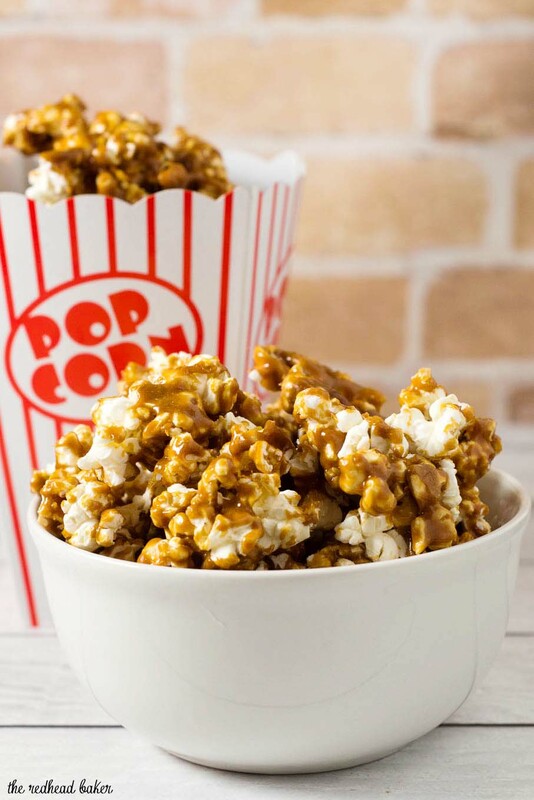 It’s so easy to make your own buttery sweet caramel corn at home! This oldie-but-goodie snack will be a hit at any party. Welcome to Angie‘s virtual baby shower! Thanks to Terri of Love and Confections for putting this event together to celebrate our fellow blogger who just gave birth to a baby boy! When Terri said that Angie had a Dumbo-themed baby shower, I knew exactly what recipe I was going to make for this event. Dumbo is all about the circus, and what says circus more than caramel corn? 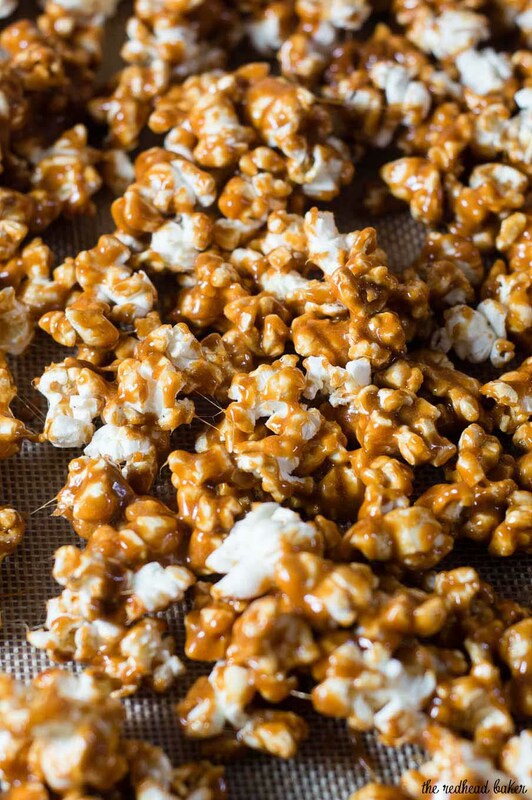 Traditional caramel corn requires baking, but this one does not. It’s so very easy to make at home, too. 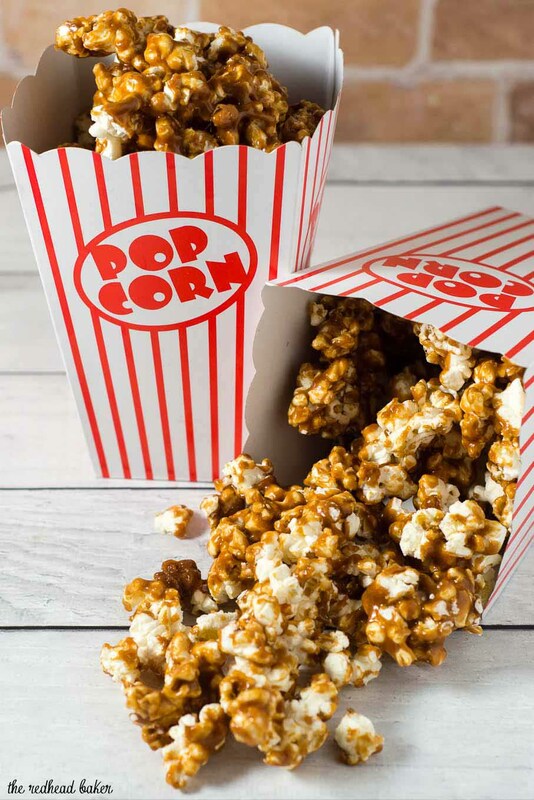 You can use any kind of plain popcorn: microwave-popped, air-popped, stovetop-popped, etc. Though it might not seem like a lot of caramel sauce, you do need to use a deep pot, because the mixture bubbles up quite a bit as it cooks, and if it boils over the edge of your pot, it will make a HUGE mess. The caramel will become foamy when the baking soda is added — don’t worry, you want that texture! The baking soda aerates the caramel and prevents it from becoming too dense. Aerated caramel means lighter caramel corn. 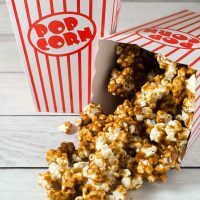 This caramel corn has the best taste and texture when eaten the same day it is made, but you can store it in a zip-top plastic bag for up to 2 days. Place the popped popcorn in a large bowl. Line a baking sheet with wax paper or a silicone baking mat. Set aside. Place the butter, brown sugar and corn syrup in a large, heavy-bottomed saucepan. Turn the heat to medium-high, and stir as the butter melts and the ingredients combine. Continue stirring until the mixture starts to boil. Once the mixture starts to boil, stop stirring and set a timer for 5 minutes. After 4 minutes, add the vanilla and stir briefly. Once the 5 minutes has passed, turn off the heat and stir in the baking soda. 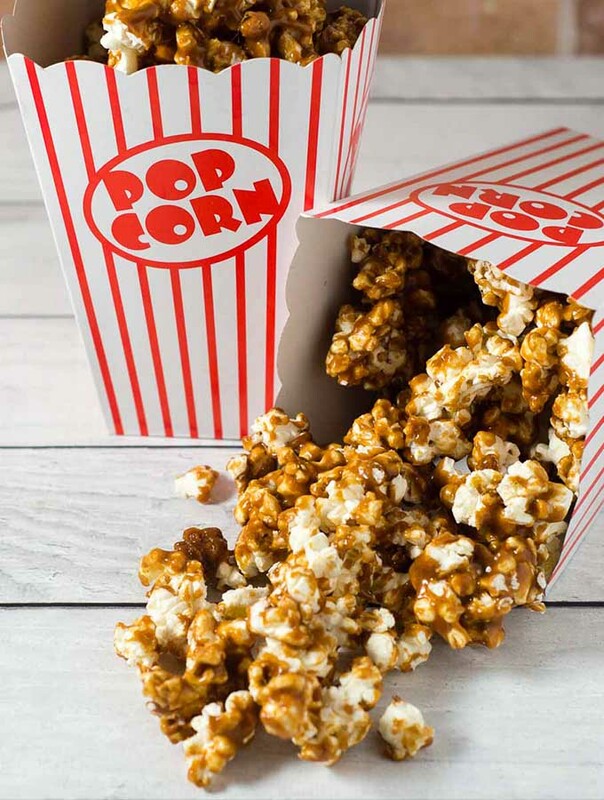 Add the popcorn by the handful, leaving any unpopped kernels in the bowl. 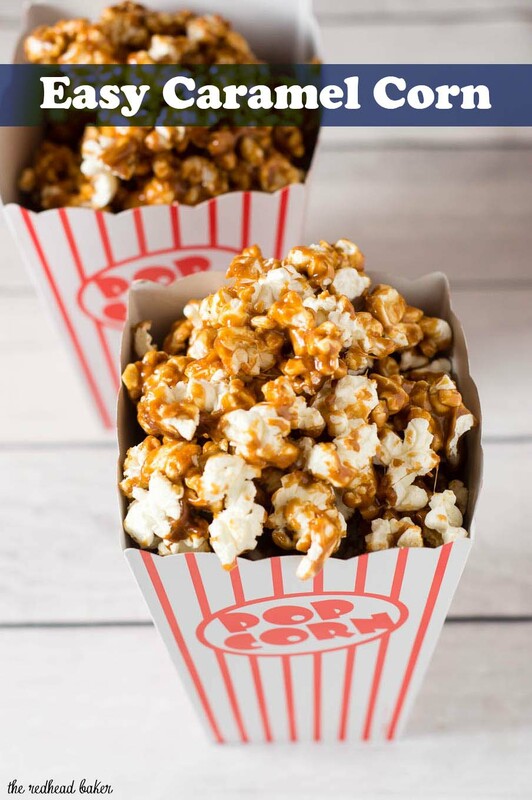 Quickly but gently stir the popcorn into the caramel until it is coated, then spread on the prepared baking sheet. Let stand at room temperature until cool. Once cool, break the popcorn into small chunks. 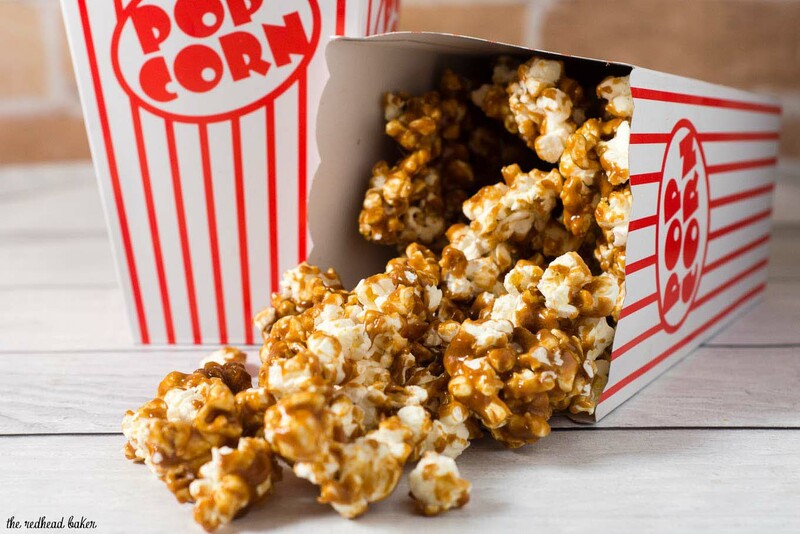 The caramel corn is best eaten the same day it is made, but can be stored in an airtight zip-top bag for up to 2 days. Please take some time to check out all the amazing recipes we made for Angie’s virtual baby shower! I love, love caramel corn! Perfect tie to Dumbo, Coleen—and it looks fabulous! The perfect recipe for our Dumbo themed baby shower!! ooo how I love this recipe! I’ve never made this at home but I love to eat it haha. So this is totally happening in our kitchen soon! Thank you so much for being a party of my virtual baby shower to celebrate Baby Jackson!!! Ooh, I’ve never made homemade caramel corn. This looks amazing!